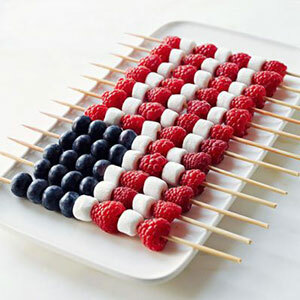 Strawberries and raspberries are the perfect, vibrant summer ingredient to use in Fourth of July- themed fare. 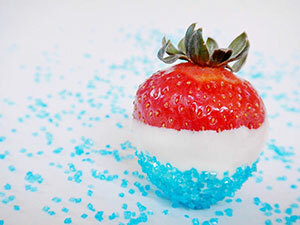 Not only do they pair well with an abundance of flavor combinations (ranging from sweet, to salty, to savory), they are also the ideal color for creating red, white, and blue dishes. 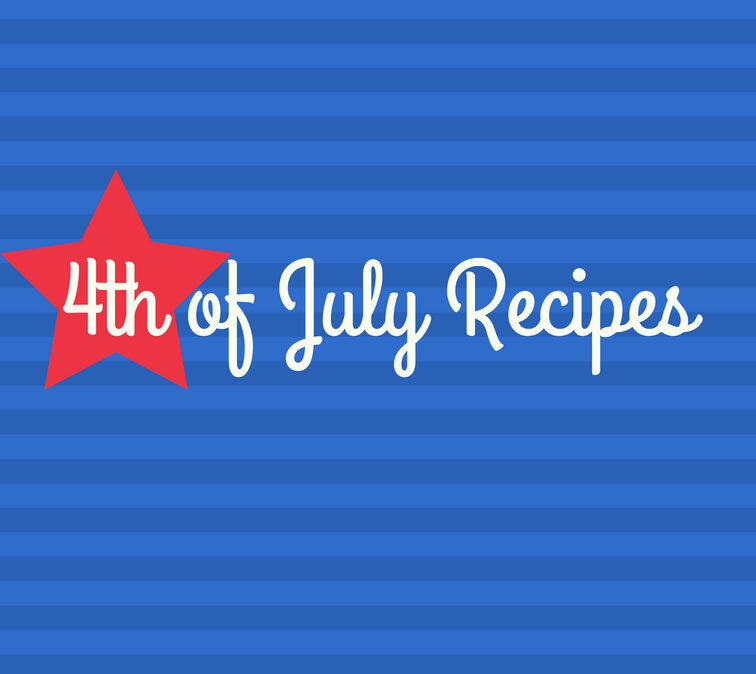 We could write a book on patriotic berry recipes (maybe we should! 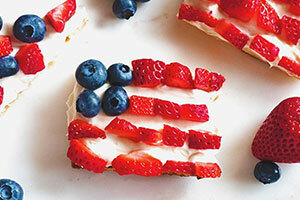 ), but in the mean time, here are a few All-American appetizers, desserts, and drinks to consider. This simple idea from Family Circle is nice because it serves two different functions. One, it’s a visually appealing replication of our American flag. Two, it offers different options for picky eaters who might not be fond of blueberries. Mini marshmallows add a touch of sweet without destroying your guest’s diet. This recipe, from Canyon Gluten Free, showcases how a simple switch (in this case, going from gluten-filled to gluten-free bread) can help create an appetizer that even your allergy-prone guests can enjoy. Swap out the cream cheese for a dairy-free alternative, and the honey for all-natural maple syrup, and you’ve created something your vegan guests, can enjoy, too. A healthier alternative to a full slice of cheesecake, these stuffed berries from Spicy Southern Kitchen give you the satisfaction of dessert, without any of the guilt. Plus, they’re pretty as can be. This healthy and heavenly recipe from Tasting Page is all at once paleo, vegan, gluten-free, and dairy-free. We love that it features strawberries AND raspberries, plus chia seeds are one of our new favorite pairings with both types of berries. This concoction is an excellent source of omega-3 fatty acids, antioxidants, fiber, iron, and calcium. 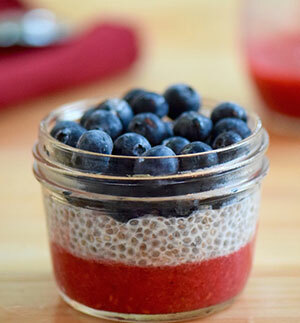 Start off your Fourth with a serving of this pudding for breakfast, and give yourself a boost of energy to get through the day. 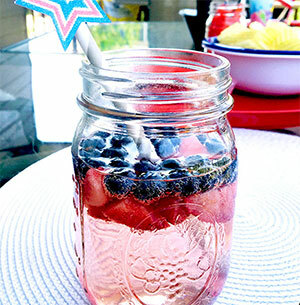 Here’s a lovely patriotic beverage from The Country Chic Cottage. It can be made with or without the sugar that’s called for in the original recipe, or the sugar can be adjusted according to taste. There are several other variations you can create depending on what you have on hand, in fact. Add in vodka or white rum if you want to sip on a cocktail, swap out the soda for flavored sparkling water if you want something a little lighter in calories and sweetness, or add in some raspberries for even more color. 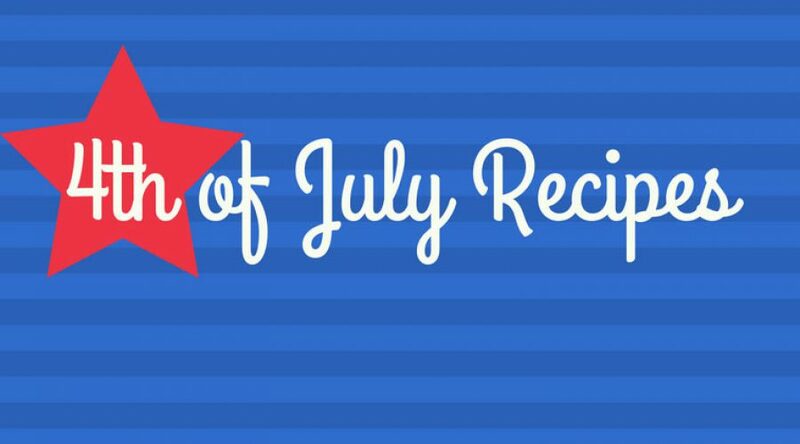 The bottom line: making a patriotic-colored drink can be as simple (and as satisfying) as tossing in some red and blue berries in a clear-colored beverage. And this would look lovely in a pitcher or punch bowl, to boot! 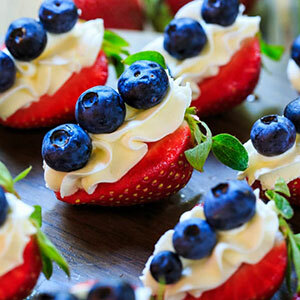 These Bacardi-filled berries from Frosting and a Smile are for adults only, so be careful if you’re making them while kiddos are around. The recipe is ridiculously simple (on par with creating a cocktail), and the end result is a unique and clever way to give your guests a tasty shot, without having to clean up a bunch of bar glasses. For more fun flavor combinations, visit our recipe page.